Complementary and alternative medicine (CAM) is increasingly used for treatment of inflammatory bowel disease (IBD). Acupuncture-type treatments are among the most popular options. Several studies have reported that moxibustion is effective in ulcerative colitis (UC). The objective of this review was to assess the clinical evidence for or against moxibustion as a treatment for UC. We searched the literature using 18 databases from their inception to February 10, 2010, without language restrictions. We included randomized clinical trials (RCTs), in which human patients with UC were treated with moxibustion. Studies were included if they were placebo-controlled or controlled against a drug therapy or no treatment group. The methodological quality of all RCTs was assessed using the Cochrane risk of bias. In total, five RCTs were included. All were of low methodological quality. They compared the effects of moxibustion with conventional drug therapy. Three tested moxibustion against sulfasalazine and two against sulfasalazine plus other drugs. A meta-analysis of five RCTs showed favorable effects of moxibustion on the response rate compared to conventional drug therapy (n = 407; risk ratio = 1.24, 95% CI = 1.11 to 1.38; P < 0.0001; heterogeneity: I2 = 16%). Current evidence is insufficient to show that moxibustion is an effective treatment of UC. Most of included trials had high risk of bias. More rigorous studies seem warranted. Ulcerative colitis (UC) is a common, chronic idiopathic inflammatory bowel disease (IBD) . Patients typically present with bloody diarrhea, passage of pus, mucus, or both, and abdominal cramping during bowel movements . UC often requires lifelong medication, but poor adherence to medication has been an important barrier to successful management. Relapse rates are high, and the risk of colorectal cancer has increased [3, 4]. Complementary and alternative medicine (CAM) is increasingly used for treatment of IBD , and acupuncture and moxibustion are particularly popular options. Moxibustion is a traditional Oriental medicine that uses the heat generated by burning herbal preparations containing Artemisia vulgaris to stimulate acupuncture points. Direct moxibustion is applied directly to the skin surface at an area around an acupuncture point, whereas indirect moxibustion is performed with some insulating materials (e.g., ginger, salts) placed between the moxa cone and the skin . The heat is then used to warm the skin at the acupuncture point. Several observational studies have reported that moxibustion is effective in UC [7–9], and animal studies have suggested beneficial effects [10, 11]. A recent systematic review included clinical trials of acupuncture for gastrointestinal disorders, showing positive effects of acupuncture . Considering that moxibustion is closely related to acupuncture, it seems pertinent to evaluate the effectiveness of this therapy under these conditions. Currently, no systematic review of moxibustion for UC is available. Hence, it was the aim of this systematic review to summarize and critically evaluate the evidence for or against the effectiveness of moxibustion as a symptomatic treatment for UC. The following databases were searched from their inception through February 10, 2010 (first searched in July 2009): MEDLINE, AMED, EMBASE, CINHAL, PsycInfo, five Korean Medical Databases (Korean Studies Information, DBPIA, Korea Institute of Science and Technology Information, KoreaMed, and Research Information Centre for Health Database), four Chinese Medical Databases (China Academic Journal, Century Journal Project, China Doctor/Master Dissertation Full Text Database, and China Proceedings Conference Full Text Database), The Cochrane Library 2010, Issue 1, and three Japanese electronic databases. The search terms used were "moxibustion" or "ulcerative" in Korean, Chinese, or English. Reference lists of all obtained papers were searched. We also performed electronic searches of relevant journals (FACT [Focus on Alternative and Complementary Therapies] and Research in Complementary Medicine [Forschende Komplementarmedizin] up to Februrary 2010). Additionally, reference lists of all obtained papers were searched, and our own personal files were manually searched as well. Hardcopies of all potentially relevant articles were obtained and read in full. In addition, the proceedings of United European Gastroenterology Week (UEGW) from 2006 to 2009 and Digestive Disease Week (DDW) from 2008 and 2009 were searched for other relevant articles. We included RCTs in which human patients with UC were treated with moxibustion. The studies were included if they were placebo-controlled or controlled against a conventional treatment, including drug therapy and another active treatment, or against no treatment. Trials testing the effectiveness of moxibustion combined with other therapies were excluded. Dissertations and abstracts were included when they contained sufficient details. All articles were read by two independent reviewers (DHL, JIK), who extracted data from the articles according to predefined criteria (Table 1). Risk of bias was assessed using the Cochrane classification in four criteria: sequence generation, incomplete outcome measures, blinding, and allocation concealment . Considering that it is virtually impossible to blind therapists to the use of moxibustion, we assessed patient and assessor blinding separately. Disagreements were resolved by discussion between the two reviewers (DHL, JIK), with the opinion of a third reviewer (MSL) being sought if necessary. There was no disagreement between the two reviewers about the risk of bias. *The most of trials didn't describe the place of remision or neing treaed for active disease in the text. Alternatevely, we report the affiliation of the authors in the brackets. §Trial divided into three or four categories, including (1) recovery, (2) marked improvement, (3) improvement, and (4) no change in terms of symptom and results of endoscopy. All clinical endpoints were considered, but the main outcome measure was the response rate for treating symptoms in patients with UC. We did not evaluate the outcomes related to immunological or other surrogate endpoints. The differences between the intervention and control groups were assessed. Relative risk (RR) and 95% confidence intervals (CIs) were calculated using Cochrane Collaboration's software (Review Manager [RevMan] Version 5.0 for Windows. Copenhagen: The Nordic Cochrane Center). Chi-square and Higgins I2 tests were used to assess heterogeneity. Where more than 10 studies were available, we assessed publication bias using a funnel plot or Egger's regression test [14, 15]. Our searches identified 377 potentially relevant studies, of which 5 met our inclusion criteria (Figure 1). The key data from all included RCTs are listed in Table 1[16–20]. All of the RCTs originated from China. Four adopted a two-arm parallel group design [16, 18–20], and one adopted a three-arm parallel group design . In all RCTs, the treatment was based on the principles of traditional Chinese medicine (TCM) as the rationale for selecting the acupuncture point. Selected acupuncture points from all trials and other information related to treatments are listed in sufficient detail in Table 2. Most of the included studies used response rate for each intervention, and outcomes were typically divided into four categories, including (1) recovery, (2) marked improvement, (3) improvement, and (4) no change. These were based on the both physician's assessment and the results of endoscopy in three trials [18–20], while the other two studies employed physician assessment [16, 17]. The setting was described in one trial , while the others did not report such details [16–18, 20]. Moxibustion Group I-Aconiti Lateralis Radix Preparata, Cinnamomi Cortex Spissus, Salviae Miltiorrhizae Radix, Carthami Flos, Aucklandiae Radix, Coptidis Rhizoma, etc. Moxibustion Group II-Santali Albi Lignum, Syzygii Flos, Bomeolum, Zanthoxyli Fructus, etc. Flow chart of trial selection process. RCT: randomized clinical trial. All of the included RCTs had high risk of bias. Of the five included RCTs, four did not describe the sequence generation. One RCT employed the methods of sequence generation incorrectly . None of the studies described any attempt to blind assessors. All of the RCTs reported incomplete outcome measures and allocation concealment. Adverse events were mentioned only in one RCT . Wen  conducted an RCT assessing the effectiveness of moxibustion on symptoms of UC patients. Sixty-nine patients were divided randomly into two parallel groups: moxibustion (n = 39) and sulfasalazine (n = 30). At the end of the treatment period, 89.8% of patients from the experimental group had improved, while the corresponding figure in the control group was 66.8% (P < 0.05). Wu and co-workers  tested the effects of moxibustion in 151 patients who were divided randomly into a three parallel groups: moxibustion group I (details of composition are listed in Table 2, n = 65), moxibustion group II (details of composition are listed in Table 2, n = 56), and a sulfasalazine group (n = 30). The response rate was 92.3% in moxibustion group I, 89.3% in moxibustion group II, and 66.7% in the sulfasalazine group. Ding and co-workers  conducted an RCT to test the therapeutic effect of ginger moxibustion on Yang deficiency of the spleen and kidney in patients with UC. Sixty-one patients were randomly divided into two groups. Thirty patients were given ginger moxibustion, while in the control group 31 patients were administered sulfasalazine. The effectiveness rate was 100%, and the curative effect was 90.0% in the experimental group. These rates were significantly better than in the control group (90.3% and 35.5%, respectively; P < 0.01). Wang and co-workers  conducted an RCT to test the therapeutic effect of moxibustion at Shenque (CV8) on UC. Sixty patients were randomly divided into two parallel groups: moxibustion (n = 30) and sulfasalazine plus metronidazole (n = 30). The total response rate was 86.7% in the moxibustion group and 66.7% in the control group. Zhou  randomized 60 patients into two parallel groups: moxibustion (n = 34) and prednisone plus sulfasalazine (n = 32). Response rates were measured by symptoms, fiber colonoscopy, endoscopy, and pathological examination. The total effective rate was 97.1% in the moxibustion group and 71.9% in the control group (P < 0.05). No adverse event was reported. The meta-analysis of the five RCTs [16–20] suggested favorable effects of moxibustion on the RR compared with conventional drug therapy (n = 407; RR = 1.24, 95% CI = 1.11 to 1.38; P < 0.0001; heterogeneity: I2 = 16%, Figure 2). A subgroup analysis [16–18] also demonstrated beneficial effects of moxibustion compared to sulfasalazine alone (n = 281; RR = 1.23, 95% CI = 1.04 to 1.46; P = 0.01; heterogeneity: I2 = 39%). A further analysis [19, 20] showed favorable effects of moxibustion compared to sulfasalazine plus metronidazole or prednisone (n = 126; RR = 1.33, 95% CI = 1.11 to 1.59; P = 0.002; heterogeneity: I2 = 0%). 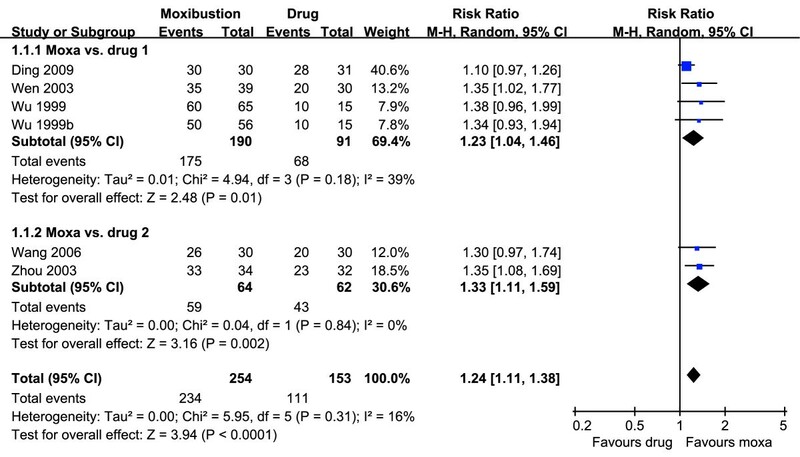 Forest plot of moxibustion for ulcerative colitis compared to conventional drug. Moxa: moxibustion. We could not assess publication bias because of the low number of studies [14, 15]. Few RCTs have tested the effects of moxibustion for UC, and none of the existing trials were methodologically rigorous. Our meta-analysis suggests that moxibustion is effective; however, the number of trials, their quality and the total sample size are too low to allow firm conclusions. Cochrane criteria were used to quantify the likelihood of bias inherent in the studies based on the description of sequence generation, incomplete outcome measures, blinding and allocation concealment. All included RCTs had high risk of bias. Low-quality trials (high risk of biased trials) are more likely to overestimate the effect size . None of the RCTs described attempts to blind patient or assessors, dropouts and withdrawals, or allocation concealment. In addition, all RCTs failed to report details regarding ethical approval. Thus, the reliability of the evidence presented here is clearly limited. It has been repeatedly noted that trials originating from China are rarely, if ever, negative . All of the included RCTs originated from China. The absence of negative results is a largely unexplained phenomenon. Whatever the causes, it does not increase our confidence in these studies. In the absence of reliable data from controlled clinical trials, other types of evidence might be helpful. The results of all of the uncontrolled trials or case reports implied that acupuncture improves symptoms of UC. Unfortunately, such data are highly susceptible to bias; hence, they provide little useful information on the specific effects of moxibustion as a therapeutic intervention for UC. By considering moxibustion as a type of therapeutic intervention by stimulating acupuncture points, we could include three other RCTs (Additional file 1). 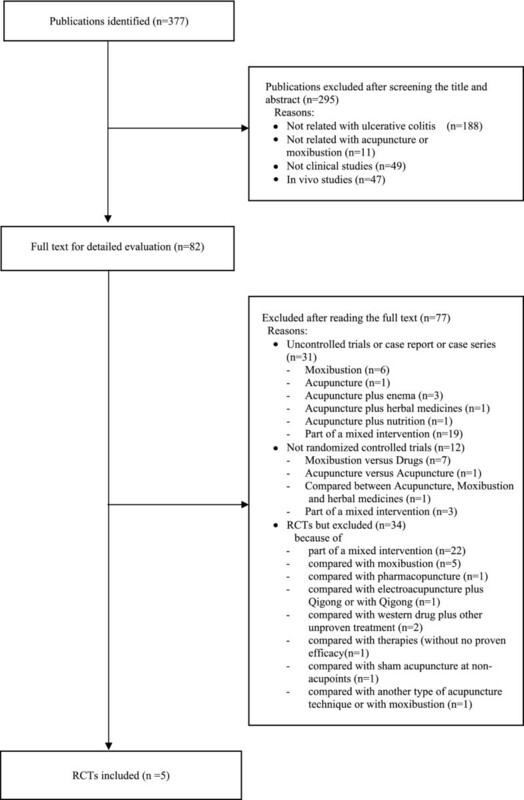 Three RCTs tested acupuncture plus moxibustion versus conventional medicines [23–25]. Two RCTs compared acupuncture plus moxibustion with sulfasalazine [23, 24]. One RCT reported favorable effects of acupuncture plus moxibustion compared to drug therapy , while the two other RCTs failed to do so [24, 25]. The pooling of these three RCTs failed to showed favorable effects of moxibustion plus acupuncture for UC compared to drug therapy (n = 273; RR = 1.15, 95% CIs = 0.91 to 1.46; P = 0.24), although marked heterogeneity was observed in this model (χ2 = 15.27; P = 0.0005; I2 = 87%; Additional file 2). Assuming that moxibustion is a beneficial treatment for UC, its mechanisms may be of interest. These may include improvement of immune function or effects on intestinal mucosal morphology and expression of GH and IGF-I [10, 26]. None of these theories, however, are currently more than speculation. Limitations of our systematic review (and indeed systematic reviews in general) pertain to the potential incompleteness of the evidence reviewed. We aimed to identify all studies on the subject. The distorting effects of publication bias and location bias on systematic reviews and meta-analysis are well documented [27–30]. In the present review, there were no restrictions on the review publication language, and a large number of different databases were searched. We are, therefore, confident that our search strategy located all relevant data on the subject. However, a degree of uncertainty remains. Further limitations include the paucity and the often suboptimal quality of the primary data. Additionally, all included RCTs that reported positive results came from China, one of the countries that produces virtually no negative results , a fact that casts some doubt on the validity of such data. All of the included studies were conducted in Asia, therefore making the conclusions limited to Asian populations. For other populations, independent replications are required. None of the RCTs included in our review were successful in minimizing bias. Collectively, these facts seriously limit the conclusiveness of our systematic review. Future studies in UC treatment with moxibustion should emphasize adequate methods to permit RCTs and the use of pilot trials to help prepare appropriate RCTs. Long-term studies are also needed to determine the longevity of treatment effects. Moreover, a cost-analysis should be considered. The evidence that moxibustion is an effective treatment for UC is inconclusive. Even though the trial data are unanimously positive, too many important caveats exist to draw firm conclusions. Dong-Hyo Lee, Jong-In Kim contributed equally to this work. DHL, MSL, TYC, and SMC were supported by the Korea Institute of Oriental Medicine. DHL, JIK and MSL conceived the study design. DHL, JIK and MSL searched and selected the trials, extracted, analyzed and interpreted the data. DHL and MSL drafted the manuscript. TYC updated the search and the content of the review. SMC and EE helped with the study design and critically reviewed the manuscript. All authors read and approved the final version of the manuscript.